Flying Clipper, directed by Hermann Leitner and featuring narration from Burl Ives, follows the untold adventures of a Swedish sailing ship and its young crew as they navigate the Mediterranean Sea in the early 1960s. This documentary is a stunning travelogue that takes you to the dreamiest destinations of the old world. Under the stewardship of Captain Skoglund, a group of 20 Merchant Marine cadets venture through historical landmarks, such as Tutankhamen's tomb, and other known wonders of the Mediterranean coastline. First Portugal, then Egypt, this odyssey travels to various points in Turkey, Greece, Italy, and Monaco, ending in Spain. Photographed in 1962 with specially designed 70mm cameras, Flying Clipper was the first German film produced in this high-resolution large format. Whether it's the spectacular imagery of the Formula 1 race in Monaco or the seascape views aboard the aircraft carrier USS Shangri-La, this documentary is a technical masterpiece that preserves the breathtaking visuals of its maiden voyage. Cinematography by Tony Braun (The Wild Geese), Siegfried Hold (Old Shatterhand), Heinz Hölscher (Rampage at Apache Wells), Klaus König (Go For It, Baby) and Bernhard Stebich. 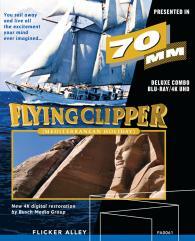 An Interview with Herbert Born - 70mm expert Herbert Born explains the process that went into restoring Flying Clipper for 4K Blu-ray. An Interview with Marcus Vetter - A film projectionist guides us through the process of screening 70mm film. An Interview with Christoph Engelke - Detailing the audio restoration for Flying Clipper and how the new Dolby Atmos version was crafted. A Restoration Comparison - Side-by-side comparison showcasing the work that went into restoring the film. Trailer Gallery - Additional 4K Busch Media Group trailers. A Program Booklet - A facsimile representation of the original program booklet.